[May 11, 2017] (The Sports Xchange) - Kentucky Derby winner Always Dreaming took to the Pimlico racetrack for a light jog Wednesday morning to begin preparing for the 142nd Preakness Stakes in Baltimore on May 20. The colt jogged around the track under an exercise rider and in the company of a pony in his first training session that was overseen by assistant trainer Ginny DePasquale after arriving from Churchill Downs on Tuesday. Head trainer Todd Pletcher was scheduled to arrive in Baltimore later on Wednesday and is expected to be on hand Thursday to observe Always Dreaming's second trip around the Pimlico track. "He looked good. He was bright, alert, checking things out, jogging with the pony," DePasquale told the Baltimore Sun. "We're happy with the way he went this morning." Always Dreaming is being housed in Stall 40, the famous corner spot which has previously been filled by Secretariat, Seattle Slew and other Triple Crown winners. 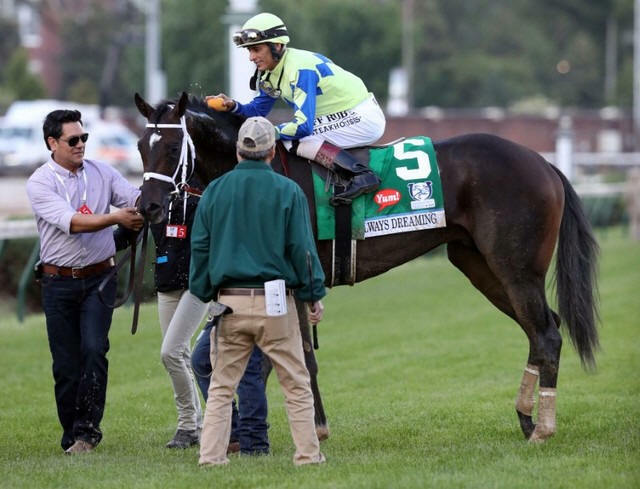 DePasquale said Always Dreaming is responding well after winning Saturday's Kentucky Derby by 2 3/4 lengths over the 1 1/4-mile track rated sloppy in 2 minutes 3.59 seconds. "The race, I think, took nothing out of him. We're happy. He bounced back almost immediately," DePasquale said.